She pedals confidently now, blond ponytail flapping from beneath her bike helmet, little legs pumping furiously to keep up with the bigger kids as she makes her way up the driveway, down the road, through the woods. It wasn’t always this way, of course. As my youngest daughter learned to ride her big girl bike last year, she was a little shaky and a bit timid. While I ran up and down our long driveway alongside her and eventually watched her pedal away on her own, I pondered the obvious parallels between the evolution from trike to training wheels to two-wheeler and the process of parenting children as they grow up and figure out the world around them, gradually expanding their horizons beyond our own view. We parents are forced to let go, a little at a time. First our children roll, then they crawl, then they walk, then they run. Before we know it they’re ditching the training wheels and popping wheelies, skiing fast down steep trails, reaching new heights in the classroom, on the field, the playground and beyond. At first, she’d wanted nothing to do with pedaling. She preferred her pink, wooden balance bike – a two-wheeled set-up without pedals – which allowed her to always be touching the ground with a foot or two. Taking both feet off the ground was too unnerving, even for a girl who has spent her earliest years determinedly matching the pace and challenge of her older brother and sister. If they dare to tell her they can do something faster or better, she quietly sets out to prove them wrong. One morning last spring, with the snow gone from even the shadiest corners of the yard, she decided that she was ready, at last, to pedal. She was unsteady in her first attempts. And so I ran alongside her, bent over and grasping her seat with one hand and her handlebars with the other, as she found her balance and gained confidence. Soon she needed me only to hold the seat, helping to control her speed, correcting the line if she veered too sharply off course. After several trips up and down the bumpy dirt driveway, she was ready for me to let go and run next to her, close enough to reach out and steady the occasional wobble. Within an hour, she was off and pedaling on her own. When her brother and sister returned from school that afternoon, they were excited to coach their little sister at the childhood skill of pedaling really fast, then slamming on the brakes to make skid marks in the driveway. We hold onto our children tightly only so long before they demand their freedom, pedaling away solo with nary a backward glance to see if we are still watching, waiting, ready to lend a steady hand in case they stumble. That’s as true of growing up in general as it is of the specifics of learning to ride a bike. As my daughter has figured out how to balance steering and pedaling, how to make long, wiggly skid marks in the dirt and pace herself on the hills, she has, I hope, learned a few larger lessons as well – even if she may not recognize them just yet. Sometimes you hit bumps and pot holes you didn’t see coming. Some of these you can cruise right through, regaining your balance quickly; others make you fall down. When the bicycle of life throws you in the dirt, it’s OK to cry a little bit, but eventually you have to get back up, dust yourself off, and keep going. Climbing hills can be exhausting, but the reward of flying downhill on the other side is usually worth the effort. There’s a great big world out there to explore, but you have to be brave enough to move beyond your comfort zone to get there. Not long after the pedaling breakthrough, we were embarking on family outings through the woods, the kids’ first mountain biking adventures. 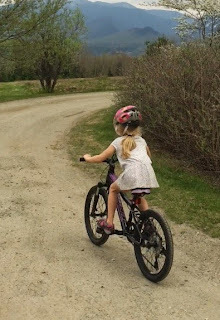 The littlest biker, the only one without gears to shift, pedaled ferociously to keep up, bouncing jarringly over rocks and roots, but keeping her balance. This spring, she got a new bike, one with gears and hand brakes. It is purple, and bigger than she was used to, and she is still figuring out how and when to shift. Still finding her balance on the steepest and bumpiest parts of the trail, where she is sometimes momentarily – and frustratingly – paralyzed by nerves. Still determined not to be left behind. And I am still walking that unending parenting line of trying to help, holding on when she needs me to (and will let me) and encouraging her to figure it out on her own, to overcome her fears and meet a challenge I know she can handle, even if she’s not yet sure she can. Last year, when she was still learning to pedal, my daughter insisted she needed me to hold her seat as she descended the big hill into our driveway. The steep pitch, combined with a sharp turn at the end, seemed a bit too scary to tackle on her own. I knew she could do it, but I grasped her seat with one hand until she told me to let go, knowing that soon enough she wouldn’t ask me to hold on. That I’ll have to keep letting go, a little at a time, and watch as she makes her own way down the driveway through the woods, into the world. Original content by Meghan McCarthy McPhaul, posted to her Blog: Writings From a Full Life. This essay also appears as Meghan's Close to Home column in the May 22, 2015 edition of the Littleton Record. I still look up each time I drive through Franconia Notch. Old habits indeed die hard, and I’ve been looking to that particular spot on the mountain’s edge since I was a kid coming north the Friday nights of my childhood and heading south on Sunday afternoons. 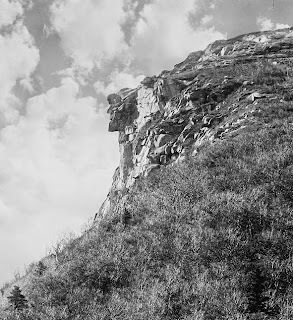 Whichever direction the family car was traveling, I peered out the window, craning my neck until we reached that magical place where the Old Man appeared, just for a moment, a stone face on a mountain’s edge. The Old Man of the Mountain has been gone, crumbled to the valley floor, for 12 years now. But I know I am not the only one who still looks for him there. On May 3, 2003, when storm clouds lifted to reveal a naked slab of granite where the Old Man had clung to the mountain for countless years, it was a national news story. People flocked to Franconia Notch to see for themselves. Reporters – myself among them – gathered with their microphones and cameras and notebooks, waiting for the governor to arrive, speculating over what forces of nature had finally dislodged the Old Man. Many people cried that day. Some still do when they look up to that changed place on the mountain. For people beyond New Hampshire, the Old Man’s demise – and Granite Staters’ reaction to it – was a passing curiosity. Some saw the profile as merely a geological wonder, a pile of rocks chiseled by the fantastic forces of nature to resemble a human face from a certain vantage point. But to many, the Old Man was much more: a tourist attraction that drew flocks of visitors to the area, an inspiration to artists and writers, New Hampshire’s state symbol since 1945, but also an indescribable sense of security. It was a point of reference for those of us who traveled through Franconia Notch, letting us know we were almost home or approaching a favorite vacation place. Promising that in an ever-changing world, this one thing was, indeed, carved in stone; seeing the Old Man meant all was still good in the mountains we love. For the past three years I have worked with the Old Man of the Mountain Legacy Fund, the volunteer group that evolved from the task force appointed in 2003 and charged with developing a long-range plan to commemorate the Old Man. The result of their tireless efforts is the Old Man of the Mountain Profiler Plaza along the northern shore of Profile Lake. There are seven steel “profilers” that allow visitors the illusion of again viewing the Old Man by lining up a series of notches and looking toward the mountain. The Plaza is lined with granite benches and paved with granite stones engraved with the names and memories of folks from all over the state and far beyond. In my administrative role with the Legacy Fund, I have learned the stories of people who have some personal tie to this place, these mountains. The Old Man is a piece of that connection, but not all of it. I’ve heard from so many others with a connection to this place. A couple who was married on the Old Man’s forehead. People who have grown up in the White Mountains and moved away, but carry New Hampshire in their hearts. Others who came here as kids with their parents and are now bringing their own children – and grandchildren – back to the same trails and mountain vistas and campsites. The Plaza is immediately adjacent to the rumbling traffic of I-93 as it weaves through the Notch, and yet it is a sanctuary. This has become a place not only for remembering the old Man, but for reflecting on family stories, on loved ones no longer with us, on the beauty of this peaceful space nestled among big mountains that mean many things to many people. My own parents, who met on the other side of Cannon Mountain, brought my brothers and me to the mountains from the time we were little. We came to ski and to hike, to splash in the cool rivers and explore the vast forests. Two of us live now in Franconia, close to where our parents have retired. The third visits each summer with his family, sharing favorite childhood haunts. My own children are growing up here, in the mountains, every day. They have been to the Profiler Plaza with me many times, dragged along as I walk in to check on things. While I tend to work duties, they splash in Profile Lake and watch the ducks swimming there. They read a few of the paver stones. They stand looking up through the profilers until they see the Old Man there, on the opposite side of Cannon Mountain from where they spend their winters skiing. When we have traveled south, away from home, my children mark our return by our passage through Franconia Notch, as I did as a child. But their eyes are trained on other things: the outline of Eagle Cliff, the tram cars moving up and down Cannon, the still waters or whitecaps of Echo Lake. My children have seen the Old Man in photographs and through the profilers, and so they know what he looked like. But they will never know that magical anticipation of peering upward from a car window as it travels through the mountains, waiting for the face to come into view, catching it just at the right moment, before you’ve traveled too far and it disappears back into the mountain. They don’t think to look toward that spot as we drive through the Notch. And although I know better, have had a dozen years to get used to the fact that the Old Man is gone, I still look up every time. Original content by Meghan McCarthy McPhaul, posted to her Blog: Writings From a Full Life. This essay also appears as Meghan's Close to Home column in the May 8, 2015 edition of the Littleton Record.